Wallis Simpson is known as the woman at the center of the most scandalous love affair of the 20th century, but in this surprising new biography, bestselling author Anna Pasternak redeems a women wronged by history with new information revealed by those who were close to the couple—presenting Wallis as a convenient scapegoat to rid England of a king deemed unworthy to rule. 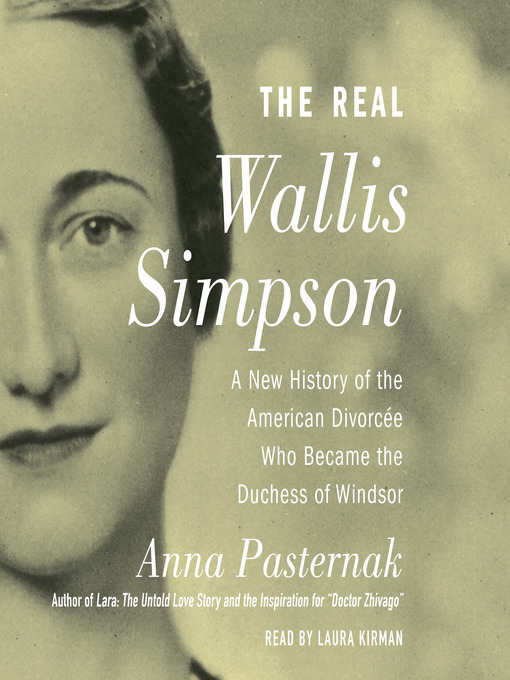 Now, Anna Pasternak's The Real Wallis Simpson tells a different story: that Wallis was the victim of the abdication, not the villain. Warm, well-mannered, and witty, Wallis was flattered by Prince Edward's attention, but like everyone else, she never expected his infatuation to last. She never wanted to divorce her second husband or marry Edward. She never anticipated his jealous, possessive nature—and his absolute refusal to let her go. Edward's true dark nature, however, was no secret to the royal family, the church or the Parliament; everyone close to Edward knew that beyond his charming façade, he was immature, self-absorbed, and uneducated—utterly unfit to rule. Wallis begged Edward to stay on the throne and let her go, foreseeing the verdict history would pass on her. Caught in Edward's fierce obsession, she became the perfect scapegoat for those who wished to dethrone the king they feared to rule. On the night Wallis died, Princess Margaret told a friend, "It wasn't her we hated, it was him."